The No.1* laundry sheet for colour protection in the UK & ROI. *Source: Panel Nielsen, volume sales. Millions of people trust Colour Catcher® - the inventor of the colour protection sheet. Colours that run in the water during the wash might bleed into your laundry. Thanks to its patented technology the sheet acts like a magnet and traps loose dye from the water - assuring maximum protection against discolouration and colour runs. The proof is on the sheet! As the sheet protects against colour transfer it allows you to wash all colours together, even with whites. 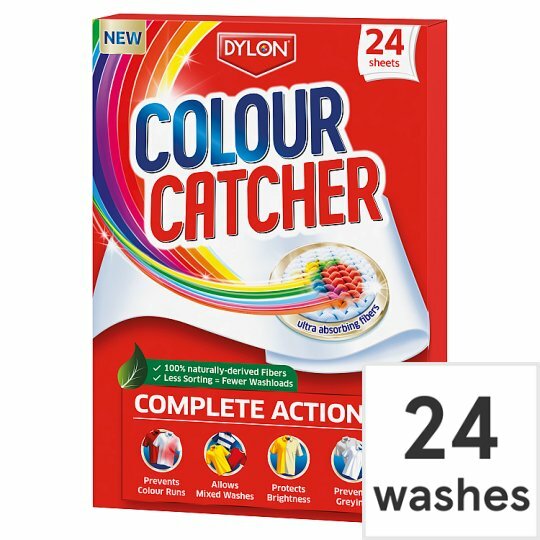 Colour Catcher® protects your laundry and saves your time and money by allowing mixed washes. Even if not seen by eye, traces of dye might deposit every wash and build up a layer of mixed colours on the garment over time - making your coloured garments dull. The sheets trap dyes from the water before they deposit on the garments. It helps to keep your colours brighter for longer! Greying is an accumulation process. Grime and dirt are traces which redeposit on the fabric during several washes and their build up becomes visible over time. By removing loose dirt particles from the wash the sheet protects fabric from greying. Extra absorbent fibres of the sheet provide maximum protection at all temperatures. For best results use Colour Catcher® in every wash. Dirt particles may also float in the wash water. With its unique feature the sheet catches released dirt particles from the wash water for a better cleanliness of your fabrics. If you need any advice, our friendly care experts will be happy to help. PRECAUTIONS: Certain fabrics are more susceptible to colour runs: dark coloured fabrics, cotton and non-colourfast garments. For such items, it is recommended to increase the number of sheets. Reasonable care should be taken if mixing colours with whites. New coloured garments should be washed separately for at least 6 first washes. Bedlinen, towels and jeans should always be washed separately. Effectiveness cannot be guaranteed where large quantities of dye run from non-colourfast garments. Always follow the machine manufacturer's instructions. Keep out of reach of children.